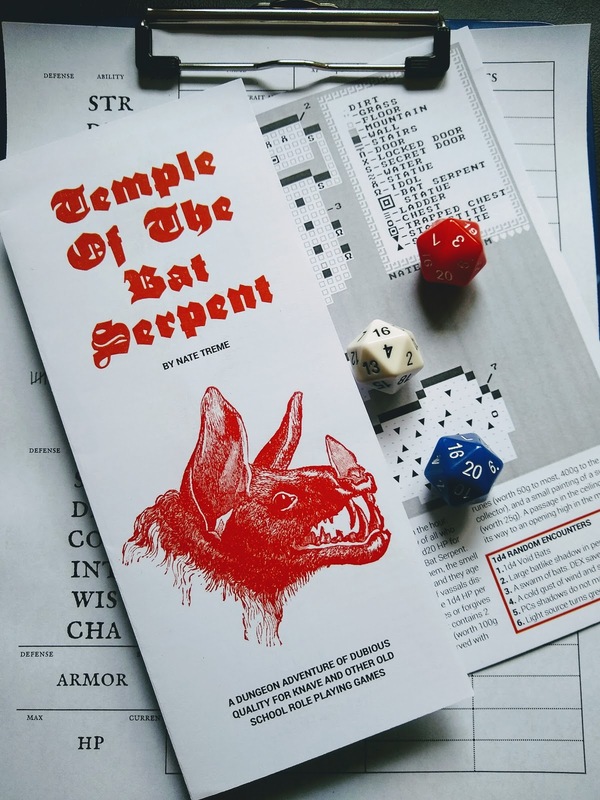 Nate Treme kindly sent me copies of two of his pamphlet-dungeons, Temple of the Bat Serpent, and The Mephitic Laboratory of the Pescamancer. Both are perfect for a low-prep one-shot, which was exactly what this past weekend called for. I choose Temple of the Bat Serpent, because I didn't want to describe some of the surgical horrors of Pescamancer to kids. Prep: I read through the pamphlet, went through it again to double check some details, put about 30 seconds of effort into thinking about how the cultists would talk. The pamphlet contained all the information I needed, and it was all readily accessible. The only supplement I used was a handful of Rory's Story Cubes for when I wanted to fluff up some extra flavor. System: Bat Serpent would run as-is with anything in the OD&D/B/Xish spectrum. I used Knave, which was great. My three players quickly generated two characters each, and everyone enjoyed the scallywags that resulted. And I enjoyed letting the players do all the rolling for combat. I gave each player one spell from the 100 Level-less Spells list. Play: With chargen, we ran the whole thing in three hours, which was perfect for our needs. It felt challenging but not frustrating. There was enough weirdo color to the encounters and loot to keep the players off-balance. I thought it was going to be pretty high-fatality, but one of the players had the spell Manse, and so they were able to set up an impregnable cottage in the middle of the dungeon, and pass the evening in restorative repose. They woke up with angry cultists on one side of the cottage and hungry void-bats on the other, but, still safely ensconced, were able to take their time and strategize their way out of the situation. As a result, they were in much better shape when they got to the Boss, which, combined with a couple very luck rolls, ended the final encounter more quickly than is ideal. Everyone laughed and had fun, and the kids (who had been annoyed that we weren't progressing our 5e campaign) asked if we could play with these characters again—which is the ultimate endorsement. If I were running it again, I'd put some thoughts into making the Void Bats a faction with overlapping-but-different goals than the Bat Serpent Cultists, and I might add some environmental challenges to the Boss' lair. And I'd practice pronouncing the Bat Serpent's name out loud. Zel-Di-ZO!-Bek. Nate is encouraging others to use this format, and it looks like a lot of nice work is resulting from it, including these nice-looking examples over on Elfmaids & Octopi. The format strikes me as a positive outgrowth of the one-page dungeon, with the tri-fold inspiring more cogent organization that a lot of one-pagers. So far, all the pamphlets I've seen have been dungeon-crawls, of which I think a little goes a long way. But it looks like Nate has a city-crawl coming up, which I'm eager to see. Maybe, should I ever have free time again, I should try a five-node mystery pamphlet. Thanks for the review Joel!!! I've prepared a new layout document of Ben Milton's Knaves. Knaves is a great, light rules set that has an extremely elegant core mechanic while retaining total compatibility with OSR material. It's pretty much the rpg of my dreams. This document contains the complete rules, plus a bunch of useful hacks from the community, plus a few of my invention, plus some useful resources from Ben Milton's previous effort, Maze Rats. The Tablet Layout is meant for scrolling on screens, and contains hyperlinks. The Spread Layout is set up to print on Letter-sized paper. The A4 Layout is set up to print on A4 paper, and is probably the most elegant of the three versions. In my previous post, I reviewed a bunch of my favorite rulesets for optimization for Play-by-Post. It occurred to me almost immediately that I hadn't really thought about Maze Rats enough. In fact, I'd mis-remembered and mischaracterized it. Upon reflection, one of the mechanics I took issue with is actually a big strength. Re-reading the rules, it seems like just a few very simple hacks could make it a highly-optimized PbP game. Danger Rolls are rolled by the GM. Danger rolls usually fail, so it is in the player’s interest to describe their actions plausibly and mitigate as many risks as they can, in the hopes that they don’t trigger a danger roll. If you have taken enough precautions to have a distinct advantage in an action, but not enough to have eliminated the distinct possibility of danger, the GM will give you a roll with advantage. I’ve played a lot of PbP games: all your favorite flavors of OD&D, AD&D, and their retroclones, Call of Cthulhu, Marvel Superheroes, Traveller, Dungeon World, etc. ad nauseam. In almost every instance, I forgot what ruleset we were using at some point. Which is a good thing. Once chargen is over, you spend a lot more time describing your characters actions and poring over the GM’s descriptions than you spend interacting with rules. When you do roll, it’s usually a combat to-hit roll, which you’ve probably programmed into the online dice-roller as a macro. Pretty much any game will work for PbP. But that doesn’t mean there aren’t points of possible optimization. A Webcomic with monsters and rockets!